There are many public footpaths and bridleways in and around Cullompton. Below you will see a selection of walks that are available in and around town - most of them are relatively easy for everybody to walk but be warned that they can all become very muddy in places after rain. They are unsuitable for wheelchair and mobility scooter users but, if you do use a mobility device, Devon County Council lists a number of accessible trails throughout Devon which can be accessed here. The circular walks generally start in and around the town centre and can be combined to create longer walks if you wish. 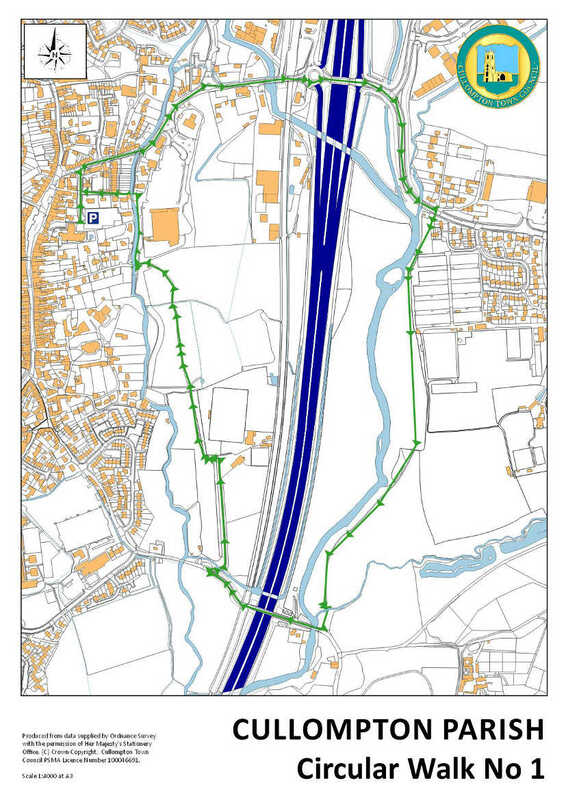 A couple of "in town" routes have been developed - one of 5km with an extension to the north of the town that extends it to 7.5km. They start at the Sports Centre car park and a printable map can be found here. It takes in several of the play areas and the long term aim is to install some outdoor fitness equipment at these parks to make the trails more challenging for those who take their fitness more seriously - please let us know the type of equipment you'd like to see and where you'd like to see it! A pleasant and easy walk of two flat miles which contrasts busy roads with green fields and waterside pathways. We will start with the least attractive part of the walk. Head from the car park (remembering, please, to Pay and Display), back along Forge Way to Station Road and turn right at the Police Station. Although this is a busy road, there is a pavement all the way as you cross the river, railway and motorway. Just before the first houses on the right, turn off across a grassy area to a gate. Continue through another gate and follow any of the well worn paths across the fields with the River Culm on your right. If you can ignore the sound of the motorway traffic, it is a very pleasant stroll. You can walk along the leat if you wish. As an aside, the leat is a man-made water course which was dug to provide the water that powered the corn mills along its route. At the next bridge, look across the leat and see the small, ivy-covered ruins of Middle Mill which at one time was part of Thomas Bilbie's bell foundry. Continue straight pas the supermarket to a sharp left turn at Higher Mill and cross the footbridge. Walk straight up the hill, turn left and find the car park where you started your walk on your left hand side. CLICK ON THE MAP TO DOWNLOAD A PRINT VERSION OF IT. 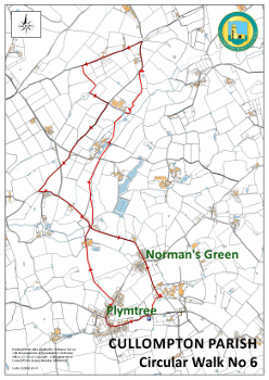 An easy to follow route consisting of just less than 3 gently undulating miles of track, footpath and country lane. BE WARNED - Parts of the walk can be very muddy after rain. From the car park, walk along Forge Way then turn left into Station Road and Right into Higher Street. Cross at the pedestrian crossing. A short way along on the left, beside Forge House, you will see the quaintly named Goblin Lane. Walk along the lane, which can be quite muddy in places and you are soon out in the country. At a T-junction of paths, turn right onto Growen Lane. Follow this track as it winds, rises gently and then drops before passing the find buildings at Growen Farm. Another gentle slope leads you onto Beacon Lane along which one of the famous chain of warning beacons was sited. Turn right to head gently back down hill towards the town. Enjoy the wide country views as you go. At a road junction, ignore the farm track on your right and follow the signpost for Cullompton. You will pass some large barns on the left and, after a bend, there is a bridleway sign on the right. This is locally known as Bluebell Lane and it can also be muddy in places. Follow the bridleway up and over the hill to emerge between house at St George's Well. Cross the road a bear right back to the car park. 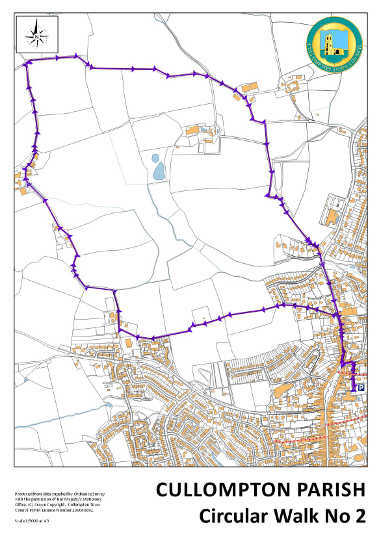 If you wish to make this walk a little longer you could park at the Sports Centre and follow the path through the CCA Recreation Fields to the Station Road area (part of Circular Walk No 1) to pick up this route and, perhaps, return via High Street from St George's Well. 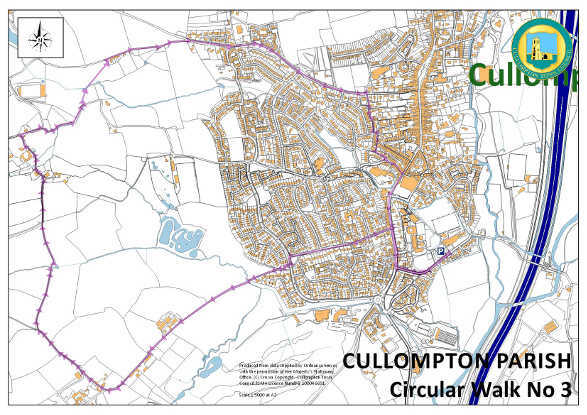 A varied walk covering parts of the town and a good loop into the countryside to the west of Cullompton. The town section is flat and the country part is undulating but never very steep. Park at the Culm Valley Sports Centre in Meadow Lane (EX15 1LL) at the southern end of the town. At the end of Meadow Lane, turn right and cross at the zebra crossing and take the first left into Colebrooke Lane. Cross at the next junction and head slightly left to continue along Colebrooke Lane and you will soon find yourself out in the countryside with views over to the golf course on your left. Walk for about ¾ miles and at the top of the rise take a bridleway on the right between two houses. At the top of this track, take a breather whilst you enjoy the view over Cullompton to the Blackdown Hills. Shortly after this, the main track bears left but you need the narrower path straight on - it drops down towards a stream and can be quite muddy. You need to cross the stream. Keep on ahead to regain the height you have lost - after a while there will be houses on both sides of the path which leads you onto a road at Knowle. Turn right and, shortly after, take the right fork. Along this windy road, look for a footpath sign on your left. Take this path, crossing a little bridge, to a gate opposite. Note Hillersdon House away to your left and turn right along the land which brings you to the old Tiverton Road where you should turn right. Keep walking towards the town and immediately beyond the Fire Station, turn right into Shortlands Lane. he land bends and then descends past a row of cottages on your right. Pass the Catholic Church, built in 1929 by the De La Casas family, and bear right at the road junction. After crossing a little stream, turn left onto the main road beside the Bell Inn. Turn right an complete the circuit. This walk takes in a trackway (uphill), a minor road (downhill) and fields. There are a number of good views to enjoy. Park on the wide roadside at the lower end of Langford. Walk up through Langford initially with the little stream on your left. The road bends left to a T-junction at Langford Cross - cross to a track. This was once a road known as College Lane and it rises steadily but quite gently for just over a mile. On the way, ignore a right turning and head on up through the trees where the view opens out and a gateway gives you the chance to look back to Cullompton, across the M5 and on to Bradninch. You will reach a minor road with White Down Copse in front of you; on the left here was once a coaching stop known as Travellers' Rest. At the top of the rise there is an overgrown triangulation pillar up on the bank and splendid views to Woodbury Common, East Hill and the Sidmouth Gap to the right and Hembury Fort and the Blackdown Hills ahead. Walk down this quiet lane to One Fir Cross. 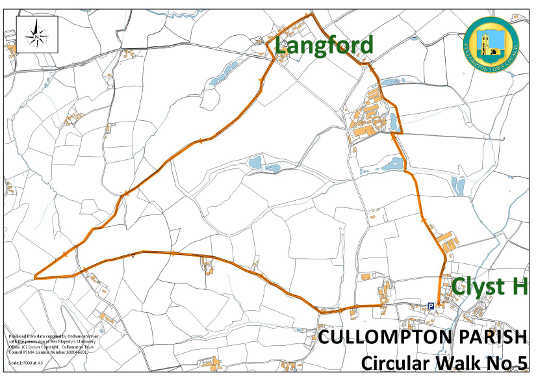 You are now out of Cullompton Parish and into Clyst Hydon. Turn left and pass the village hall and at the next junction, bear right. After such a quiet lane, this stretch of road could be busier as you approach the village. Now for the third side of the triangle. Just beyond the school sign, turn left onto the footpath which takes you alongside the field and past the church tower. Go through the gate and keep ahead, now on a road, into Twynhayes Farm passing farm buildings and going through the gate ahead. Keep the hedge on your left through two fields and, when you cross the stile between them, you reenter Cullompton Parish. As your approach a wooden fence, veer slightly right to a concrete path - this passes the fine Tudor farmhouse on the left. Cross and continue ahead past the red-brick Langford Green Cottages to return to the start of the route. This walk is in sections which meet and diverge so you can improvise and walk all or part of it. In its entirety it is the most substantial of these circular walks. However, as it largely follows the course of the little River Weaver, it is virtually flat throughout. Fields and gateways can be very muddy in wet weather. Park at Plymtree village or, for the shorter version, on the wide roadside at the triangle just west of Higher Weaver. Leave Plymtree on the high pavement with the church on your right and you will soon reach a footpath on the left beside a thatched cottage. The route across the fields is across stiles and through gates to Sangishayes Farm is easy to follow - walk through the farmyard and down the drive towards a fine Devon longhouse opposite. Cross the road and the river, where you also enter Cullompton parish, and follow the path straight ahead, with the river on your right, through three fields to emerge onto a lane to the right of a house. Cross the lane and the river and keep on the same line through the field where you will cross a bridge and turn right as waymarked. Next you need to cross another smaller bridge across a ditch on your left, taking the right path as it diverges to emerge through a gate to Haywards Farm. Cross the ditch and turn right, then left and keep going along the top of this field to a kissing gate and then cross the final field to a footpatgh sign with the roof of a house beyond. When you join the road, turn right and walk past Clarke's Thorne to a road junction and turn left, signposted for Mutterton. About half a mile and at the end of a stretch of woodland, turn onto a bridleway (which is relatively new and not shown on older maps). At the end of the woods turn right to walk along the edge of the next field and then left along the hedgeline again to a gate onto a wide track - bear left to a road where you turn right and walk back to Higher Weaver. To return to Plymtree, cross ahead at two sets of crossroads the second of which is Higher Weaver Cross. After a quarter of a mile, at Middle Weaver Farm, a footpath turns off to the left along the edge of a field to rejoin the Plymtree road. Turn right and, as you walk, there are good open view on the left over to the Blackdown Hills. At Norman's Green crossroads, head straight over and at the bottom of the dip, between houses, a footpath heads off to the right. Follow it across the field towards the village hall and, at the road, turn right, walk past the school and back to your car. CLICK THE MAP TO DOWNLOAD A PRINT VERSION OF IT.